What other basic knowledge do we need to create, or to monitor the activities of, a computing or software company? Answer, quite a lot, to do the job properly! But common sense and experience, and a little now on internal company services and management, will get us by. Bott, Coleman, Eaton & Rowland in their "Professional Issues in Software Engineering" devote a chapter to the analysis of a single company - read it! Or, of course, the similar material in later texts. 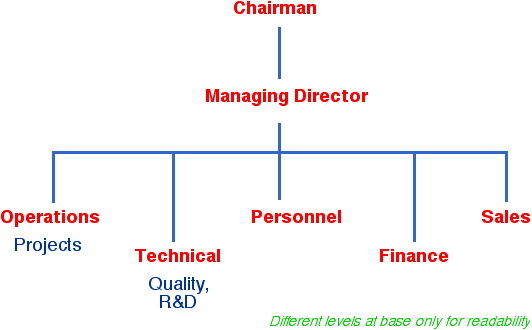 Here, we look very briefly at a typical organisational structure for a small company, and at some of the general issues associated therewith. We have already looked briefly at this area, when we were thinking about the geographical or functional company organisation under which a company was constituted. Here, we are concerned to take a closer look at how that organisation might be developed into a proper management structure. There are many ways of doing this, some flat (as, for example, at Agilent), some highly hierarchical (probably the norm). The most obvious pattern is a straight-forward structure of divisions, each with its own director; the diagram gives a simple example - but an example which also displays a number of important points. - which contains the twin branches of "Research & Development" and "Quality Control"
It is vital for a company's long-term health that R&D staff are not side-tracked into the day to day urgencies of close-to-market operations. And it is, if anything, even more vital that responsibility for quality control is independent of the operational line management. Quality control really does matter! But you get nothing for nothing in this world ... and the down side of this independence is that a particular worker can all too easily receive conflicting instructions about priorities. Careful and responsible management will ensure that this does not happen, for if it does the staff will rapidly lose confidence in the company ... and then quality will suffer, the very thing we are trying to avoid. but usually the lines of management can be sufficiently clear to eliminate this conflict. Note also that "Personnel" - Human Resource Management as it is now increasingly known - is a free-standing branch. This is a reflection of the extent to which any service company, but especially one in the skill-intensive world of computing, is heavily reliant on the quality of its staff. ... but either of those choices leads to another, and potentially serious, conflict of interest. This is a point which our normally good textbook fails to bring out. any union negotiations which may be appropriate. The other headings used in the diagram are essentially self-explanatory, linked to what has gone before in the earlier chapters of these notes. ... the management structure, of course, should only marginally be influenced by the personalities involved (theory says, not at all, but we all have to live in the real world and make things work! ), but the effectiveness of the structure is determined by the people who operate it. Like most extremes, both have difficulties! I have just been reading your tireless self in the 'Commercial and Industrial Review'. Good stuff. Being one of the small minority which uses abuse and sarcasm (and so leaves you unmoved) will you say whether we had better try unfailing kindness as a management technique. ... too much can go wrong at the last minute! ... clear direction, yes, but usually a minimum level of control will pay dividends. Would you buy a fridge from IBM? Or even a security system from Intel?